For nearly 10 years I held hope to see a heartbeat on an ultrasound screen, to hold my husband's hand and dream of the next 9 months to unfold. At one point in my journey I had lost all hope of ever experiencing the gift of pregnancy and birth. We had given up and started what we at the time thought would be a "sure thing" - adoption. If only I knew then, what I know now. My husband and I were in our early 30's when we started infertility treatment. We tried 11 cycles of IVF and frozen embryo transfers. With each cycle, hope would rise anew to only be dashed. And if we did get pregnant, we always heard those words from our nurse "cautiously optimistic" to only be disappointed when no heartbeat was seen on the screen. After so much disappointment, we decided that perhaps pregnancy and the joy of birth was not God's plan for us. We started an adoption process and we were blessed with a 7 month old boy who we named Xavier. We decided to adopt again. We received our referral of a baby girl and flew down to Guatemala on several occasions to not miss out on those early months. We were once again in love and had bonded with the newest addition to our family. Unfortunately, laws changed and we found ourselves mired in an international struggle to get our baby girl out of Guatemala. My heart was once again broken. I can't begin to describe the agony associated with every month that passes knowing that your baby is getting bigger and yet still not home. Or the annoyance and expense of renewing fingerprint testing required every year, home study updates and USCIS and Guatemala regulated paperwork. Not only had infertility treatment failed but even adoption eluded us. The struggle to continue to pursue our adoption in Guatemala was taking its toll after more than 2 years had passed since our baby girl had been born. I was blessed to have started to work at Shady Grove Fertility Center. One of the physicians was astute enough to recognize the incompleteness I felt and gently encouraged me to consider donor egg because of its high success rates. At first, I wasn't interested, but my husband wanted to learn more. After time I recognized that using the vibrant eggs of a 20 or 30 year old, I could have biological children and my husband could have the genetic connection that he desired. After so much failure, it took a special doctor to feel confident enough in the treatment to get my hopes up again. 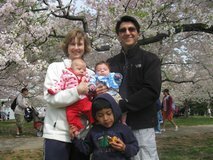 My husband and I started donor egg treatment in 2009, three and a half years after we had started the second Guatemala adoption which continued to linger on. Ultimately, we transferred 2 embryos and 2 weeks later learned we were pregnant -- with twins. Being pregnant was wonderful and I feel immense gratitude for the opportunity to have experienced it. I remember back on that time and can now see the enormous wall I had built around my heart. Even early in the pregnancy, I was afraid to feel or express too much emotion. I was afraid that it would be a fleeting moment in time as the previous pregnancies had turned out to be. It wasn't until I felt the babies move, did I really know that we would be parents again. 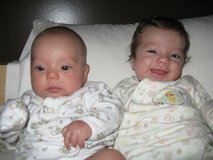 We gave birth in December of 2009, to two beautiful babies. Our adoption in Guatemala had moved into its fourth year and our "waiting" baby had become a pre-schooler. In October 2011, over 5 years after we started our adoption in 2006, we received official notice that the baby we had visited, hoped for and loved would never come home to us. As you can imagine, the news was devastating to hear. Momentarily I felt the emptiness that had plagued us most of our marriage. I then looked at my children and my heart swelled. While it is hard to lose a child you have held in your arms and called your own, it is even harder to have never had the opportunity to begin with. In the days that followed, I held my children a little tighter and thanked God that I have them in my life. If I had known in the early years that it would all work out, I wouldn't have put my life on hold. On the other side of my infertility struggle, I've come to be grateful to have experienced it. It has made me a better mom and a support to my friends who face their own journey with infertility. The road to parenthood may be short or long and take many twists, but it will eventually arrive at its destination.